Rich Site Summary (RSS) was developed way back in 1999 as a way to quickly subscribe to blogs and newspapers, back before tools like Twitter feeds made it so easy to find and read articles. Over the last 17 years, RSS has largely faded from popular usage, but developers never stopped working on it. Today, if you want to streamline your information diet, RSS offers tons of advanced tools that make consuming content a breeze. You can either actively discover content or passively stumble upon it. Lets say you decide you want to learn to code. You go to Google and search “learn to code for free.” You find Free Code Camp on the first page of the Google results, sign up, and start progressing through its coding challenges. This is called active discovery. Now lets say you were just browsing Facebook and you see one of your friends talking about Free Code Camp. This is called passive discovery. You click on the link, bookmark it, then move on with your Facebook-ing, only to never get around to visiting the site again. My bookmarks. Don’t end up like me. These examples demonstrate why even if you stumble upon something relevant in social media, you can still end up wasting time. If you don’t have time then and there, you will most likely open a tab or bookmark it. You’ll never get back to, because if you’re busy now, you’re likely to be just as busy later. Contrast this with a google search, which you’ll only do at the exact moment that you need something. You know how you get a notification when a friend tags on Facebook? Well, you can get the exact same sort of notification from an RSS feed reader when a friend publishes a new article on their blog. 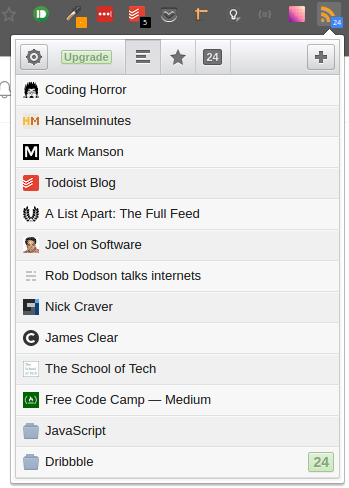 Here’s the RSS feed reader Chrome extension that I use on my desktop. This will add a nice little icon on your chrome extensions bar, and every time you are on a blog where a feed exists, there will be a little “+” sign so you can “subscribe” to it. Let’s say you are looking to form better habits, and you find a nice blog about habits like James Clear’s blog. Now, thanks to this Chrome extension, you can just click the + sign and it will add that blog to your feed. From this point on, whenever James Clear writes an article, you will have a pending notification on that bar until you mark it as read or — better yet — go and read it. 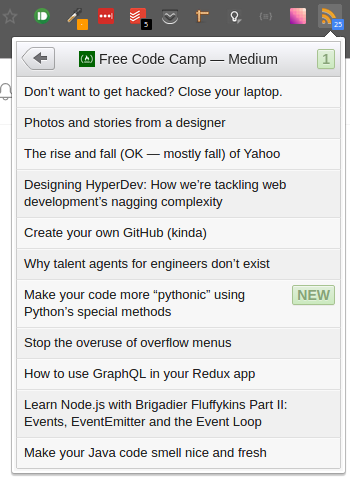 Notice how I have subscribed to Free Code Camp’s Medium articles? That’s right — you can even subscribe to your favorite Medium publications, all in one place. This means you won’t have to open Medium and scroll through your its news feed just to find posts from your favorite publications. Subscribing to blogs in this way saves you massive amounts of time, because you are targeting what you want to read. You can even see the titles, so you never have to open the website only to find out that you’re not interested its newest content. And that’s not all! You can even make folders, then combine your thematically similar blogs to better manage them. This often helps me when I am trying to focus one particular topic, and looking for inspiration. 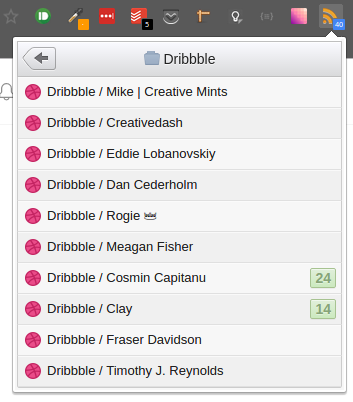 Do you use Dribbble for inspiration? Me too! And I follow a lot of designers there. With RSS, you can create folders for Dribbble feeds for individuals designers, so you’ll be the first to know whenever your favorite designers post new content. You can do the same for Material UP inspiration. The Chrome extension comes packed with lots of other useful features, like the ability to star certain blogs combine them, and even subscribe to podcasts. And if you prefer emails to notifications, you can configure this extension to send you emails about particular blogs, and at designated times of your day when you’re likely free to read them. You should stop passively surfing. According to a CNN report, teens spend up to nine hours a day on social media, and check their news feeds up to 100 times a day. Now, if I didn’t know any better, I would assume that adults are not like teens, and place a higher value on their time. They wouldn’t end spend their days constantly checking social media. But the reality is, as adults, we end up spending a lot of our time checking our social media instead of actively searching for content that is immediately relevant to us. When we say we are “surfing the web,” what we are really doing is stumbling upon links which have nice clickbait headlines, only to later realize that the content didn’t teach us anything new. Nor was it relevant to whatever task we were trying to accomplish at the time. We often find ourselves scrolling through our Facebook news feeds, clicking links our friends have shared, worried that if we don’t do this we may “miss out” on something. But in all reality, little of this content is essential. Productivity enthusiasts are quick to point out that this “fear of missing out” is misplaced, and that most such content won’t make any real difference in our lives. The problem with email lists. The biggest reason for the decline in popularity of the RSS feeds has been that websites have shifted to manually sending you email newsletters with links to their recent blog posts. It’s nice to stumble upon a website and be able to stay up-to-date by simply giving them an email address. But if they are not the subtle type, and start bombarding me with emails every day, I am going to feel overloaded at first, then eventually unsubscribe. As you can see, getting 10 promotional emails a day isn’t exactly the most fun way to consume blog content. I have my own designated time to read these posts, and if I don’t get to them because I’m working, I will most likely never get back to them. With RSS, I have a list of all the blogs that I’ve subscribed to, along with how many new articles each has posted since I last checked them. And I can just leave them as unread for now, then approach them later in a more systematic way. This way, instead of dealing with random emails that pop up in the middle of my workday, or in the middle of the night when I am trying to sleep, all the content I want to read goes to the same place, and I can get to it at my leisure. Thanks for reading. I hope this article — and RSS feed readers — can help you be more productive. Again, here’s the free Chrome extension I use for RSS. If you enjoyed this article, make sure to press that green heart to show your support.